Ampersand Scratchbord tools allow the user to render thin, controlled lines for cross-hatching and fine detail on Claybord, Scratchbord, or scratch art boards and papers. Each tool creates specific effects and texture. This kit contains two scratch nibs — fine point and curved, with a plastic nib holder, a stainless steelwire brush, a parallel line tool, and a fiberglass erasing brush. 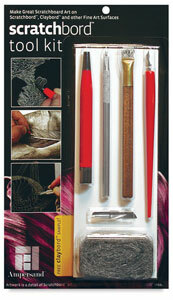 The kit also includes a 4½" × 11" (11 cm × 28 cm) sample of Scratchbord. ™ Ampersand is a trademark.™ Scratchbord is a trademark. ™ Claybord is a trademark of Ampersand Art Supply.